In today’s demanding global economy, maintaining a competitive edge is essential to a firm’s survival. In order to survive, a business must learn more quickly than its competitors how to optimize operations so it can service clients more efficiently and it is becoming more difficult with each passing day. The number of businesses adopting Lean Six Sigma methods is growing because many organizations across a wide variety of industries that have embraced this mindset and approach have reported significant successes. Business leaders have learned that a continuous improvement mindset, process control and process improvement maximizes the probability of sustainable and long-term success. Their experiences have taught them that good is never good enough and that striving for continuous improvement is a key component of their core values. It is no accident that my personal values include Commitment to Quality and Customer Service. Customers throughout the world today expect the order, the product or the service they purchase to be right the first time. In Lean Six Sigma terms, this is a concept that is known as First Time Right. Sometimes this approach may take longer up front, while processes and procedures are being established and refined, however, the efficiency a firm can realize through this mindset over the long term is seen by lower costs resulting from reductions in rework, reductions in process revisions and fewer complaints to be handled. The benefit of implementing Lean and Six Sigma together is discernible – each methodology focuses on and optimizes the various components of a process. Six Sigma reduces variation and weaknesses identified in a process, while Lean significantly improves process efficiency and removes non-value-added steps. Business leaders have learned that an effective approach for eliminating non-value-added steps (also known as waste) is to set about addressing everything that does not meet the first time right principle. So, if you are striving for a process that is speedy, devoid of defect and without waste, Lean Six Sigma can help you achieve these objectives. Lean Six Sigma facilitates alignment in an organization by getting people and teams focused on what is necessary to work more efficiently and effectively. Lean Six Sigma focuses a company on customers and their buying criteria (critical-to-quality requirements). Lean Six Sigma process improvement identifies what matters to clients and focuses everyone on what is most impactful to the customer. 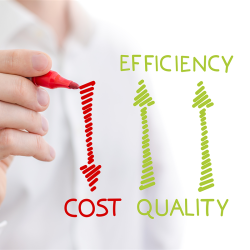 Lean Six Sigma ensures that the customer will realize and benefit from improvements. Lean Six Sigma helps a business identify non-value-add in its processes more quickly and easily than it did prior to using the Lean Six Sigma methods. Organizations who adopt Lean Six Sigma methods often find that a very high percentage of non-value-added steps are present in existing processes. In today’s business world, customers are not likely to pay for non-value-added steps that make products and services more expensive than alternatives. One could argue that they are only willing to pay for value-added steps to the product produced by the process. Given that customers more frequently set the selling price for a product, products produced by a process with multiple non-value-added steps will likely be priced too high to achieve an attractive gross profit margin. One of the most compelling factors for embracing Lean Six Sigma is that everyone involved in a process will develop an understanding of how that process operates and how each improvement project has implications for them and the bottom line. The value of having everyone understand how the steps in a process impact the bottom line of the business is apparent when solution-oriented and action-oriented mindsets become part of a company’s culture. Customer-Centric – the Voice of the Customer (VOC) is what rules the organization. Focused on Financial Results – Every improvement project is evaluated and prioritized based on its financial bottom-line impact to the organization. Passionately Involved – the CEO, senior leaders and managers at all levels of the organization are directly involved and visibly committed to improvement. Disciplined – The specific roles provide a framework for rolling out, mentoring and sustaining Lean Six Sigma efforts. Through the implementation of the Lean methodology, the resulting process enhancements will often transform the way things are done in the organization, which may cause some differences of opinion in the company. This type of transformation has a low likelihood of succeeding in the absence of strong leadership and management involvement. Lean Six Sigma is much more than a set of tools. In many organizations today, the two have been successfully combined into one methodology that capitalizes on the elements of both Lean and Six Sigma. Most of all, however, Lean Six Sigma is a management philosophy – a culture. In order for Lean to deliver results, it requires having operating mechanisms in place and skills leaders will need to learn. Business leaders who have embraced the Lean Six Sigma methodology have found it to be a different and more powerful way of achieving peak performance.